The latest version of the WSU Spine framework has been released as 1.2.2. Over the last several weeks since 1.2.1, we’ve been able to focus on several minor bugs related to various layout issues in both cropped and mobile views. WordPress 4.1 “Dinah”, named for jazz-singer Dinah Washington, was released today. Around 10:30am, the central platform server was updated to coincide with the release. This was a very smooth cycle with some great progress and included contributions from a record 283 people! Many improvements will be unnoticeable on the surface at WSU, as much of the work was done to improve code we will take advantage of while building the platform. Look for those that are missing from the list below on your own personal installations of WordPress as they are pretty fantastic. New session tracking will watch for other browser and computer sessions that are using your credentials when logged into the platform. If you are concerned about what other machines are currently logged in, you can check your profile by clicking on your name in the top right. At the bottom of your profile page will be one of the two screenshots above, allowing you to clear all sessions. In the future this will be expanded to list all of your sessions so that you can see what computers may be logged in. As you can see in the screenshot above, the distractions around the post editor have been removed as I write this post. If I’d like access to other options at any point, a move of the mouse outside of the editor will cause the screen to re-fill so that I can save, add categories, or update the post as needed. This feature is off by default, and can be enabled in many contexts by clicking on the distraction-free writing icon in the upper right of the editor. Most of the sites at WSU will be using our Spine Parent Theme to be a part of the overall brand presence. We do have sites being used by students and classes that will now have access to the new default theme—Twenty Fifteen—as part of their suite. As a blogging focused theme, Twenty Fifteen does a great job of allowing you to focus on your content while also offering many customizations to the look and feel on the front end. I’ve been using it on my personal site for months and have been happy thus far! We’re always looking for feedback around the WSUWP Platform, the Spine, and anything else web related. Please reach out over email (jeremy.felt@wsu.edu) if you have any questions. We also have a great open lab session in ITB 2025 every Friday morning from 9:30am-11:30am where we discuss the web at WSU. A major cornerstone of WSU’s Spine Parent Theme for WordPress is the open source theme, Make. For several months we’ve been behind on some great upstream changes from that theme, focused more on our own customizations. Today we’re happy to announce that version 0.17.0 of the Spine Parent Theme mirrors the builder functionality provided by Make 1.4.6. 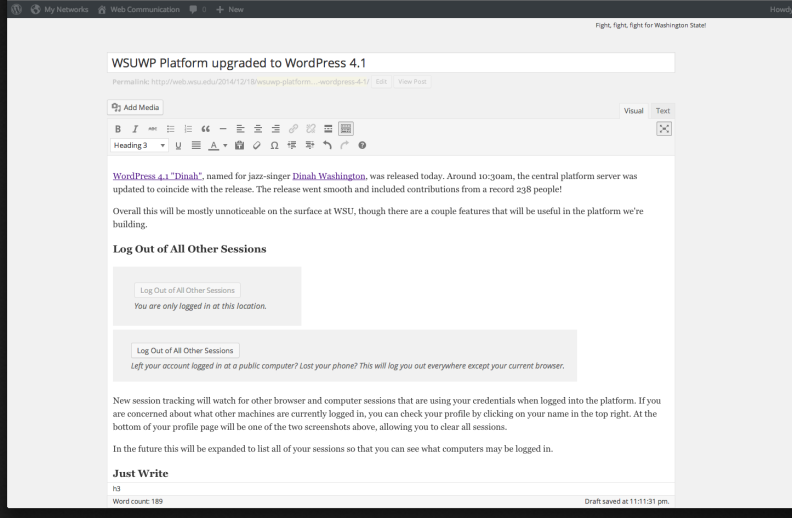 You’ll likely notice the change immediately if you use page builder for creating pages in WordPress as there have been several improvements to the interface. When you choose a section layout, you’ll see a couple different configuration icons available. As demonstrated in the animation below, clicking on these will bring up an interface for adding custom classes or other options to the sections and the columns within. While the ability to add custom classes and wrappers to sections has been in the page builder for a while, adding custom classes to individual columns is new. We hope interfaces like this allow designers and front end developers to stretch the bounds of the page builder and the WSU Spine framework while continuing to make it easy for those who manage content. The interface around the banner/slideshow feature has been improved quite a bit as well. There are still some areas which will require custom CSS on the front end, and we’ll be tackling a default set of styles for that in the near future. In 0.16.1, we added a class to main for search results pages to help with targeted styles. In 0.16.2, we added template support for the very much in alpha University Center Objects plugin. In 0.16.3, we corrected an overlapping media query that caused the WordPress admin bar to jump at the wrong time. The option to set Slide URLs was not appearing properly in the builder. This has been resolved. Campus signatures are now available for most campuses in Appearance -> Customizer. 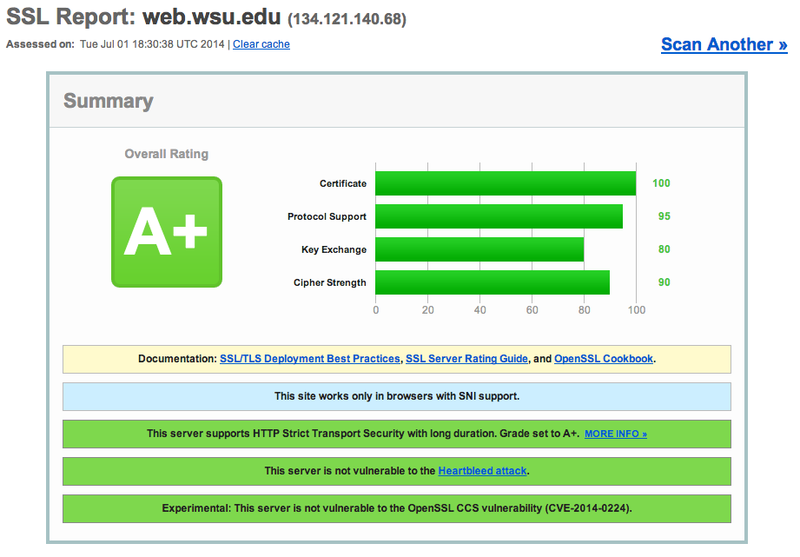 To automatically receive the benefits of bug fixes like this, we recommend using the latest version of the Spine from the centrally hosted repo.wsu.edu server. The above are the current, best URLs and are cached by browsers for an hour. When a new minor version is shipped, bug fixes and enhancements will appear very quickly. We will not break backward compatibility in a minor release. These have the benefit of being cached in browser for 120 days, though require attention whenever the Spine is updated. These are cached in the browser for only 10 minutes and can be considered bleeding edge. This is the first place to test fixed bugs, but may also be considered unstable from time to time. Updates will continue to be posted on this site about the Spine and other web projects. You can also follow along with development at the WSU Spine repository. Archive pages for tags and university categories were displaying Archives as a generic sub header. This has been changed so that the name of the tag or category is displayed instead when viewing an archive of posts. Our default 404 text was This is somewhat embarrassing, isn’t it? While this is light hearted to some, it can also be embarrassing in itself. We’ve replaced it with a standard Page Not Found and will attempt to provide something more useful to the visitor over time. Individual slides in slideshows built with the builder templates can now have URLs assigned to them. If a URL is assigned, the entire slide will be wrapped in that URL. An option is now available under Advanced Options in the customizer to display either full content or an automatic excerpt on archives of posts where there is no manual excerpt or inserted read more tag. This is a site wide option and will affect all archives. Version 0.15.0 of the Spine Parent Theme has just been released. There is a significant change in how columns are presented in the builder template sections as well as a couple more minor updates. Previously, when a “columns” section was added to the page, we displayed each of the columns at 50% width. This was the same for sidebar right, sidebar left, halves, thirds, and quarters. While this was almost useful in helping to show how content would display on the front end, it made it very tough to manage large blocks of content in simple layouts–especially when the majority of that content was going in one of the columns. Today, the templates have been changed so that each column fills 100% of the section width when editing the page. Columns are stacked on top of each other in the order they will display on the front end. Each column has a toggle to expand or minimize the full content area when editing. This state is persistent when saving the page, so comes in very handy when dealing with large pages. We’ve also added more social channels to be configured through the Customizer. Flickr, Instagram, Vimeo, and Google Plus URLs can now be entered. If you are using the develop branch of the WSU Spine (configurable through advanced options in the Customizer), you will see icons immediately. If you are on version 1, these icons will appear when the next major release of the Spine is deployed. And finally, we’ve removed the sidebar class from the sidebar right and margin right page templates. This was deprecated a while ago in favor of the more explicit side-right, margin-right, side-left, and margin-left classes and is not targeted anywhere in the Spine framework. On June 30th, 2014, WSU’s University Communications’ web team released version 1.0 of the Spine framework.